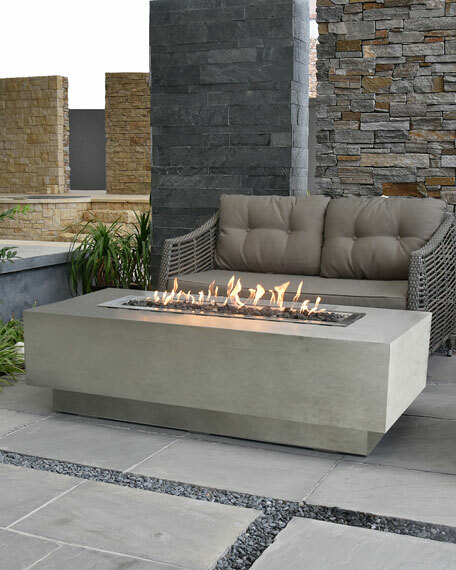 Granville Fire Table features a large rectangle design. High performance concrete and stainless steel fire burner. Center piece design is accented with lava rock to enhance flame. Handcrafted fire pit table includes lava rocks. Overall, 60"W x 27.4"D x 16.9"T.
Glass-fiber reinforced concrete resists chipping and cracking. 30" stainless steel burner system creates up to 45,000 BTUs. Connects to natural gas hookup. Boxed weight, approximately 193 lbs.